Suzanne Rozdeba Sign outside of Obscura. Two of the neighborhood’s celebrity misanthropes were at it earlier this week. 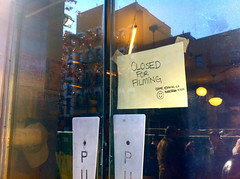 On Wednesday morning, a small crowd of “Oddities” fans stood outside Obscura, on Avenue A, while the show filmed inside. Mike Zohn, an owner of the store, told The Local that the show’s fourth season was being filmed, and would start in January after a best-of retrospective and a holiday episode. Meanwhile, another trafficker in antiques and oddities, Billy LeRoy of “Baggage Battles” (also in the midst of a new season) e-mailed us the above photos of his coffin finally being removed from the Houston Street lot where his antiques tent used to stand.